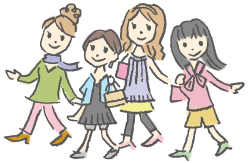 In Oishida, it is "we collect early summer rain and play cool air Mogami River" and "we gather early summer rain, and Basho who composed does already later Mogami River" and Mogami River which we changed. It is spot that we want to experience once as having felt to be what we saw and thing that we experienced. Scenery of the mountains protruding from cheerful singing voice and both sides of Sendo whom only person who went on board understands lets flavor different seasonally feel and pleases. We stay for Shinjyo for 2 night and leave Shinjyo on June 3 (current July 19) of the old calendar. In place of Basho embarkation, there is Sue image made of open kiln Higashiyama, Shinjo ware where we had in 1841 (Tenpo 12). 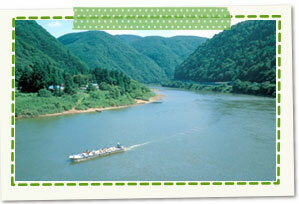 Motoaikai located the west of Shinjo-shi sent marine products to Nairiku with special products such as safflower from Sakata to Osaka at place that prospered in Mogami River water transportation. In addition, there was this place in rice dealer of Shinjyo feudal clan land tax rice. The neighborhood of Motoaikai is place that is dangerous at the time of flood in Mogami River in place with much meandering, but color of mountain changes in the four seasons, and eight Mukaiyama to be seen from Route 47 leaving for the Sakata area is attractive places. "Depths icehouse fathom ru yanagikana of Wed" which we wrote per day at Shibuya family tradition style bower is phrase of thanks for service. Court banquet of icehouse of the Imperial Court event that "icehouse" in phrase eats ice on June 1 and prays for health. Person entering Shinjyo castle bottom at the south quenches throat in Shimizu that there was in the depths of avenue, and "yanagikana" means place that fixed appearance. 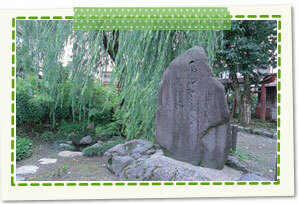 Rich spring water sprang out until the early days of the Showa era. 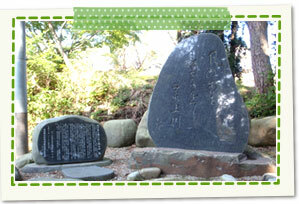 It is restored in 1988 (Showa 63), and there is in residential area. 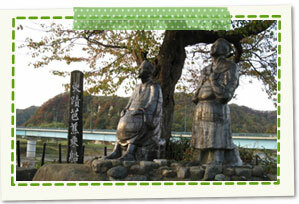 It is designated historic spot of Shinjyo . (1689) haiku poet Basho went over Seki before Sendai territory urine with hiryo of disciple in 1689 and hurried in route to country of Dewa. But if "climb Oyama, and Sun already goes down, and kick, see Hojin-no-Ie (old border agent's residence), and I need living in. It is said to be because of heavy rain unwillingly as we spell in "narrow path of putting" saying wind is in confusion on 3rd and quits and does stay in mountains that there is not when we stayed in this house on 3rd in 2 nights. 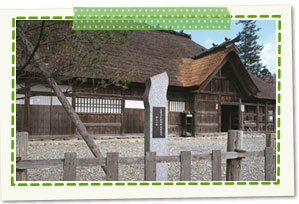 Building existing in house that Basho stayed is "Hojin-no-Ie (old border agent's residence)". One of the mountain passes where Natagiri-toge Pass links Obanazawa-shi to Mogami-machi. Altitude is only 470m, but the north Mogami side is steep, and the south Obanazawa-shi side does the relatively gentle topography. 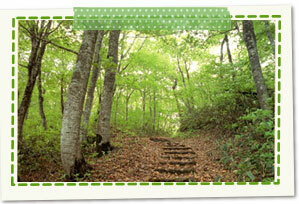 We save as History road, and paths of mountain pass which Basho went over are maintained, and it is in walk road. 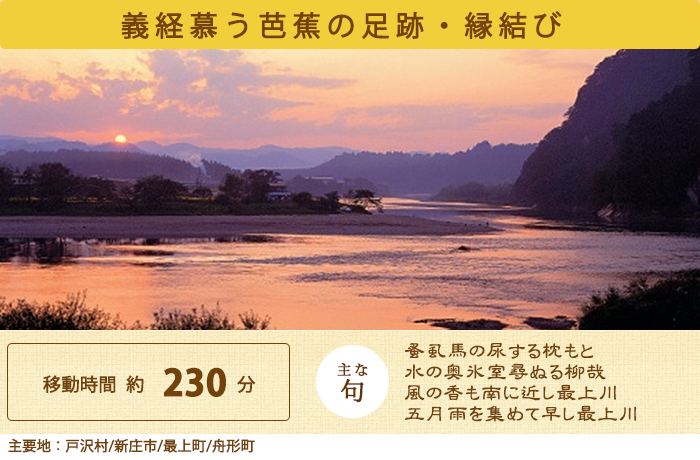 Many tourists come during Basho visit period. The Japan's three biggest guardian deity of children "monkey Haneyama guardian deity of children" is worshiped, and it is said that matchmaking, child life extension include benefit, and many worshipers visit monkey feather mountain pass which was point of former Dewa way. "Way of new Oku-no-Hosomichi matchmaking" and Matsuo Haiku Monument of Basho have hiking course from to Promenade of monkey Haneyama Park. In Funagata-machi Historical Museum, replica of clay doll "Jomon VENUS" of Jomon period largest in Japan (country-designated important cultural property) is displayed, too. Do you not feel matchmaking and power of the beauty?